The Silver Way is perhaps the definitive resource for all aspiring character designers. It’s a huge book measuring about a foot wide and packed with over 220 pages of tips, exercises, and sample designs. Each chapter leads you further towards the goal of creating great characters. It starts off by explaining what’s required to become a great designer and what character design actually means. The author Stephen Silver has decades of experience working as a cartoonist and a character designer in the entertainment industry, some of his most notable work being on the TV shows Kim Possible and Danny Phantom. He offers live mentorship and gives back to the art community by helping other artists learn & understand character design. And this book is just one more example of his generous teaching style. Here’s a great quote from Stephen’s introduction that really covers character design in a nutshell. The designer not only has to understand how to construct a character, but also must develop solutions along the way, by building something from nothing. What is ultimately important to understand is that being a professional character designer requires good ideas, the ability to draw in many styles, and a solid sense of draftsmanship. Each chapter in this book has many sub-chapters with lessons that you can follow. It’s very much a practical book and is meant to be read cover-to-cover, maybe even multiple times, to really get the full effect of Stephen’s suggestions. There’s also a few dozen pages for a foreword, afterword, and a large index along with an overview “about the artist” section explaining Stephen’s work history and credentials. But the real meat & potatoes of this book spans about 220 pages with detailed guides for artists. These cover many topics like using the golden ratio, finding rhythm, observing from life, and creating believable gestures. The 3rd chapter explains the Silver way of designing characters by truly analyzing the character. What is this character’s history? What’s their story? How would that affect the character’s design? Their clothes, their posture, their behavior? A great character designer asks questions and knows how to transform information into a clear design. You’ll learn about character thumbnailing and working from simple sketches into polished concepts, colored pieces, and final cleanups/revisions that lead to a completed character design. Pretty much the entire process through-and-through! If you want to create amazing characters from scratch then this book is for you. 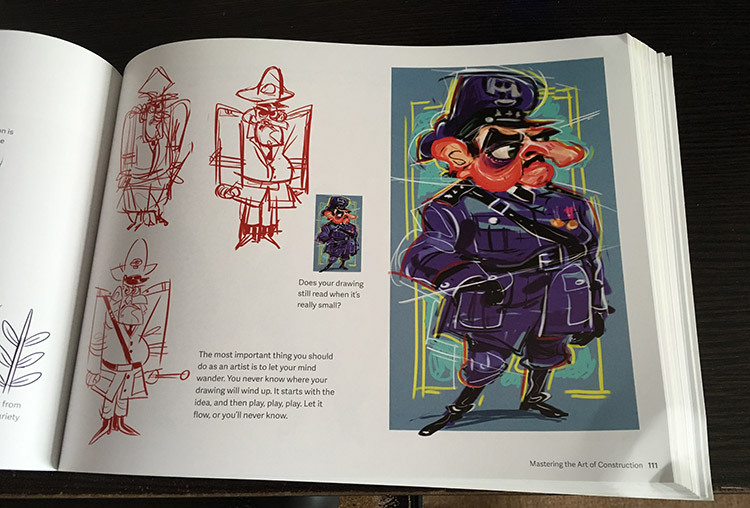 I made a lengthy list of character design books and do think those are excellent for aspiring character designers. But The Silver Way is on a whole other level. It’s a must-own for any serious character artist, vis dev artist, animator, comic artist… pretty much anyone working(or hoping to work) in entertainment art. Even someone who prefers doing environment designs still benefits from understanding how characters are created. The exercises in this book are extremely practical for everyone and they apply to more than just human characters. It’s good to practice animal characters following Stephen’s advice considering the amount of Pixar and Disney movies that feature animals as leads. Stephen’s tips in this book are guaranteed to help you improve designing humans and nonhumans alike. All of these tips just make sense and they’re super easy to consume. 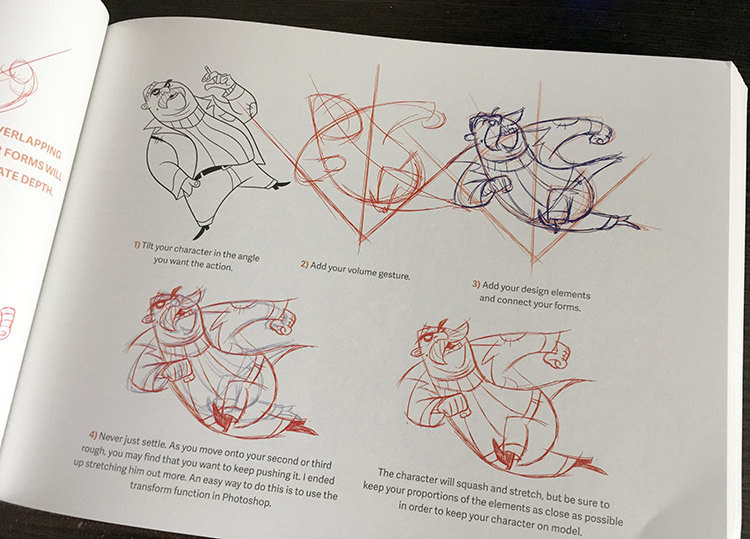 Many follow a style of “do this, not this” along with plenty of example sketches. 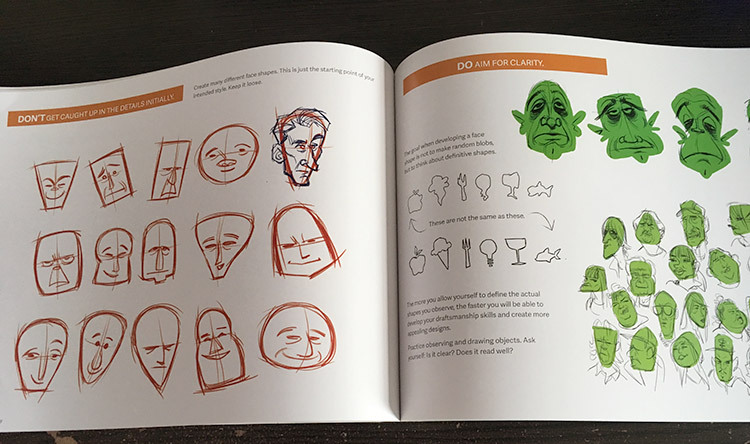 It’s the perfect guide for anyone looking to improve their sketching abilities and create more believable characters. You’ll learn how to play with shapes, restyle gestures, build rhythm, and how to work from life to create caricature designs based off references. Perhaps the best part of this whole book is that it’s super easy to read. Even a complete novice could pick this up and understand these concepts. Granted a novice may struggle to apply these concepts in their practice work so a beginner’s book would be a good choice too. But as I mentioned, these exercises are so practical and easy to follow that anyone can understand them. No matter what your skill level you should walk away with at least one new piece of knowledge or technique from this book. The Silver Way is absolutely worth the money and it’ll teach you how to design believable, industry-level character designs from start to finish. Stephen’s writing style is also pretty easy to digest and you’ll carry his tips with you for life. Now if you’re hoping to do backgrounds or prop designs then these tips may not be as useful on your journey. 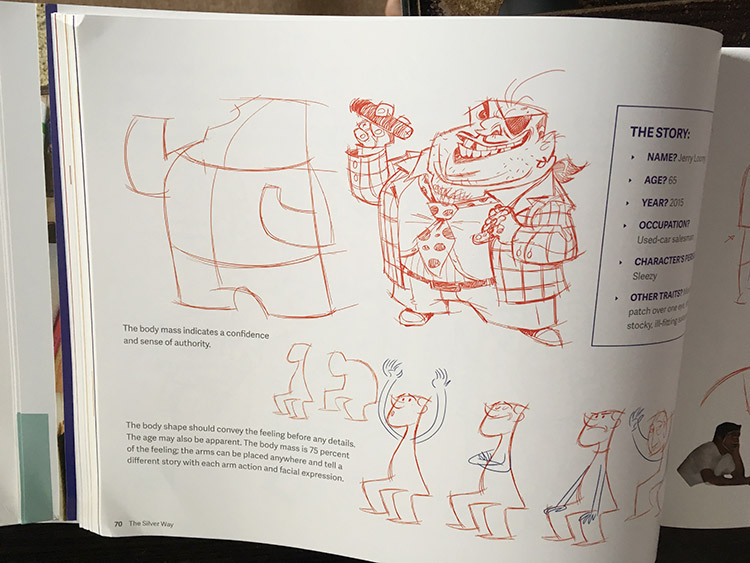 But if you want to do character design, storyboarding, comic art or anything similar then this book is a must-own that’ll skyrocket your character design skills up a quite few notches.